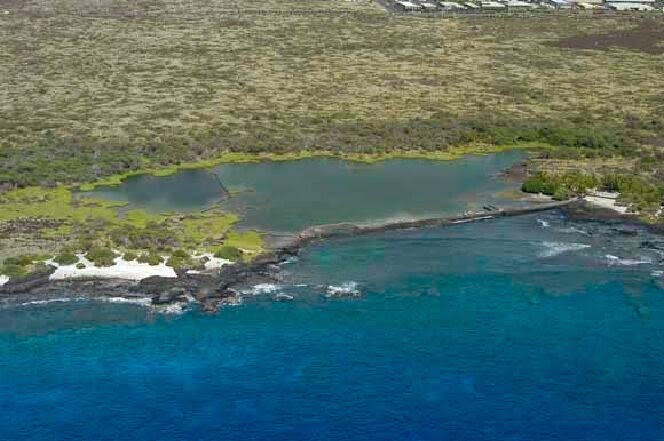 Kaloko-Honokōhau National Historical Park (KAHO) was established in the Kekaha region of North Kona (Kailua to Kalaoa) in 1978 in order to preserve and protect traditional native Hawaiian culture and cultural sites. The physical location of Kaloko-Honokōhau made the settlement easy to manage. Situated on the lower portions of a sloping terrain, the settlement’s activities were directed by kahuna chiefs, from a vantage point, such as the bluff overlooking the fishpond of ʻAimakapā, where a commanding view of Kaloko-Honokōhau was available. Nearby (also in the Park) are the remnants of the ʻAiʻōpio fishtrap. An opening in the trap to the sea enabled fish to enter, and the walled sections of the trap allowed fish to be stored until needed. At high tide, fish entered the trap by swimming through the seaward opening or over the submerged walls. At low tide, the fish were trapped in the enclosure and were easily netted. Fishtraps differ from fishponds in that the fish are trapped and caught, but not raised. The 1,160 acre park, a landscape of rugged lava rock, was at one time a thriving ancient Hawaiian settlement. More than 200 archeological sites document the Hawaiian’s use of the area over time. The Hawaiians of this ancient settlement harvested fish from the sea and from fishponds they constructed. They grew coconuts, sweet potatoes and gourds and raised chickens and pigs. Those living closest to the shore harvested fish and other food from the sea, while others living within the ahupuaʻa (sea to mountain land division) grew staple resources such as taro, breadfruit, paper mulberry, wood, and fiber for clothing. To ensure everyone’s survival, they would trade these items with one another. Hale Ho’okipa Visitor Center, the Hawaii Pacific Parks Association store, and the adjoining parking area are open from 8:30 am to 4:00 PM daily. (The Kaloko road gate is open from 8:00 am to 5:00 PM daily.) Admission to the park is Free. The image shows Kaloko Fishpond at Kaloko-Honokōhau National Historical Park (USGS.) In addition, I have added other images in a folder of like name in the Photos section on my Facebook and Google+ pages.